The reasons of infringements in work of the engine of a chainsaw is often clogged the carb. This is due to the use of substandard petrol or ingress of foreign matter fuel tank. To clean the carburetorand it must be completely disassembled. How to repair a chainsaw "Calm"
Before proceeding, drain the fuel from the gas tank. Unscrew the mounting screws on the top cover of the chainsaw and remove it. Remove the air filter housing, the filter element and remove the housing by removing the nuts. Often, in addition to the screws, the casing is held with clamps. Otdelnie them by clicking the appropriate tabs. On the right side of the carband remove the fuel hose and pull the air damper. Unscrewing the mounting screws and nuts on the body of the carband remove it and remove the cable terminal from the lever throttle. On the left side pull the fuel hose from its fitting. 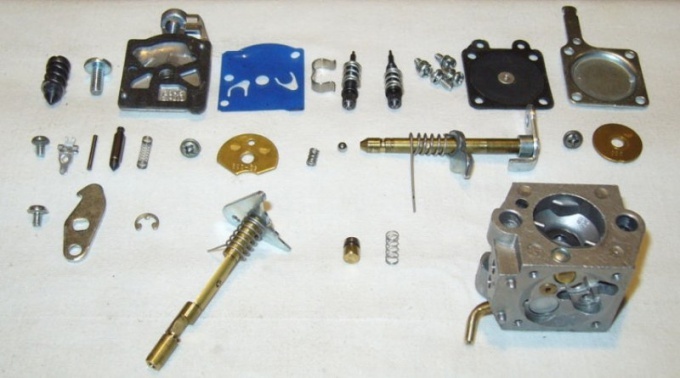 Remove the screw of adjustment of idling speed and the fixing screw top cover carb. Remove the top cover and find the fuel diaphragm fuel pump having a blue transparent strip. On the left side of the case you find the screws with spring clips. After removing the bracket, Unscrew the screws. Record label or remember their installation locations to avoid confusion during Assembly. Unscrew the screws on the bottom cover of the carband remove this cover. Remove the node of the needle valve by removing the screw. Be careful – under duplechin lever valve actuator is installed spring. Unscrewing the screw of the air shutter, remove it. Then remove the axle of this valve, by applying force along it. Hole axis of the air vent cover in advance with your finger, in order not to lose the spring loaded ball in it. Remove the throttle valve by loosening the screw of its fastening. Then remove the lever of an actuator and a spring washer-stopper. Please note: the screws securing the throttle interchangeable and the screw of fastening of the lever of an actuator is very similar but has a different length. Don't mix up the screws when assembling. In conclusion, remove the throttle shaft, noting its correct position. Lay on the table all the details of the carband inspect them with the purpose of Troubleshooting. Worn parts and damaged gaskets replace the new. All parts are thoroughly rinse with the use of specialized detergents and dry with a lint-free cloth. The nozzles and tubes dry with compressed air. For easy purge use manual or foot-operated air pump. With the purpose of increase of efficiency of cleaning of the parts in the carband use an ultrasonic bath, for cleaning using the cavitation effect. To do this, fill it with gasoline or diesel fuel, put in it all the necessary elements of the carband and turn for 2-3 period of 5 minutes each. At the end of the process blow the parts with compressed air.